The Barclays Capital 1–3 Year U.S. Aggregate Index tracks the performance of domestic, taxable investment-grade bonds with average maturities of one to three years. The Barclays Capital 7-10 Year U.S. Aggregate Index tracks the performance of domestic, taxable investment-grade bonds with average maturities of seven to 10 years. The Barclays Capital 10-Plus Year Aggregate Index tracks the performance of domestic, taxable investment-grade bonds with average maturities of greater than 10 years. The Barclays Capital Corporate 1-Year Duration Index tracks the performance of the short term U.S. corporate bond market. The Barclays Capital Emerging Markets Bond Index tracks the performance of external-currency-denominated debt instruments of the emerging markets. The Barclays Capital TIPS Index tracks the performance of U.S. Treasury inflation-linked securities. The Barclays Capital U.S. Aggregate Index tracks the performance of the broad U.S. investment-grade, fixed-rate bond market, including both government and corporate bonds. The Barclays Capital U.S. Treasury Index tracks the performance of U.S. Treasury obligations with a remaining maturity of one year or more. The Credit Suisse High Yield Index tracks the performance of the global high-yield debt market. The Credit Suisse Leveraged Loan Index tracks the balance and current spread over LIBOR for fully funded term loans. The Dow Jones UBS Commodities Index is composed of futures contracts on physical commodities. The FTSE EPRA/NAREIT Developed Index tracks the performance of developed-market REITs. The FTSE NAREIT All Equity REITs Index includes all tax-qualified REITs listed on the NYSE, AMEX, and NASDAQ National Market. The HFRI Equity Market Neutral Index tracks the performance of equity market neutral strategies. The JPMorgan Emerging Markets Bond Index tracks the performance of Brady bonds in the emerging markets. The Morningstar/Ibottson SBBI U.S. Inflation Index measures U.S. inflation. The Morningstar/Ibbotson SBBI U.S. 1-Year Treasury Constant Maturity Index tracks the performance of U.S. Treasuries with maturities of one year. The Morningstar/Ibbotson SBBI U.S. Intermediate-Term Government Bond Index tracks the performance of intermediate-term government bonds. The Morningstar/Ibottson SBBI U.S. Long-Term Government Index tracks the performance of a one-bond portfolio with a maturity near 20 years. The MSCI Emerging Markets Equity Index tracks the performance of stocks in select emerging markets. The MSCI World Energy Index tracks the performance of energy stocks in developed world markets. The MSCI World Infrastructure Index tracks the performance of infrastructure stocks. The MSCI World Materials Index tracks the performance of materials stocks in developed world markets. The S&P 500 Index tracks the performance of 500 leading U.S. stocks and is widely considered representative of the U.S. equity market. The S&P Goldman Sachs Commodity Index (GSCI) is a composite index of commodity sector returns representing an unleveraged, long-term investment in commodity futures. The S&P/Citigroup Global Gold Index tracks the performance of gold. The S&P/LSTA Leveraged Loan Index tracks outstanding balance and current spread over LIBOR for fully funded loan terms. Duration is a measure of a fund's sensitivity to interest-rate changes (the longer a fund's duration, the more sensitive it is to changes in interest rates). LIBOR, or the London Interbank Offered Rate, is the most widely used benchmark or reference rate for short-term interest rates. LIBOR is the rate of interest at which banks borrow funds from other banks, in large volume, in the international market. “Overweighting or underweighting” means having a higher or lower weighting, respectively, in a given sector or security than a benchmark. Shorting is borrowing, then selling, a security with the expectation that the security will fall in value. The security can then be purchased and repaid at a lower price. “Spread” refers to the excess yield a bond sector provides over another sector or index (such as U.S. Treasuries with similar maturities or LIBOR). A yield curve is a graphical representation of how yields on bonds of different maturities compare. Normally, yield curves slant up, as bonds with longer maturities typically offer higher yields than short-term bonds. Index and term definitions Equity index returns assume reinvestment of all distributions. Index returns do not reflect fees or expenses, and it is not possible to invest directly in an index. 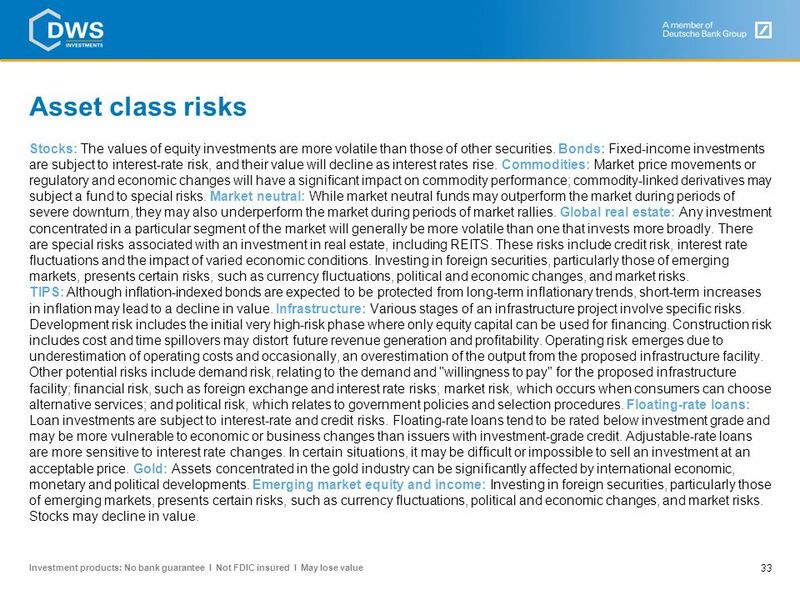 On slide 29, asset classes are represented as follows: alternatives, 20% FTSE EPRA/NAREIT Developed Index, 20% HFRI Equity Market Neutral Index, 20% Barclays Capital TIPS Index, 15% commodities blend (see below), 10% MSCI Emerging Markets Equity Index, 10% JPMorgan Emerging Markets Bond Index, 5% S&P/Citigroup Global Gold Index; commodities, 50% S&P Goldman Sachs Commodity Index, 25% MSCI World Energy Index and 25% MSCI World Materials Index; emerging- market (EM) equity, MSCI Emerging Markets Equity Index; emerging-market (EM) income, JPMorgan Emerging Markets Bond Index; infrastructure, MSCI World Infrastructure Index; global real estate, FTSE EPRA/NAREIT Developed Index; gold, S&P/Citigroup Global Gold Index; floating-rate, S&P/LSTA Leveraged Loan Index; market neutral, HFRI Equity Market Neutral Index; TIPS, Barclays Capital TIPS Index; U.S. stocks, S&P 500 Index. Asset class representation Equity index returns assume reinvestment of all distributions. Index returns do not reflect fees or expenses, and it is not possible to invest directly in an index See Slide 3 for index definitions. 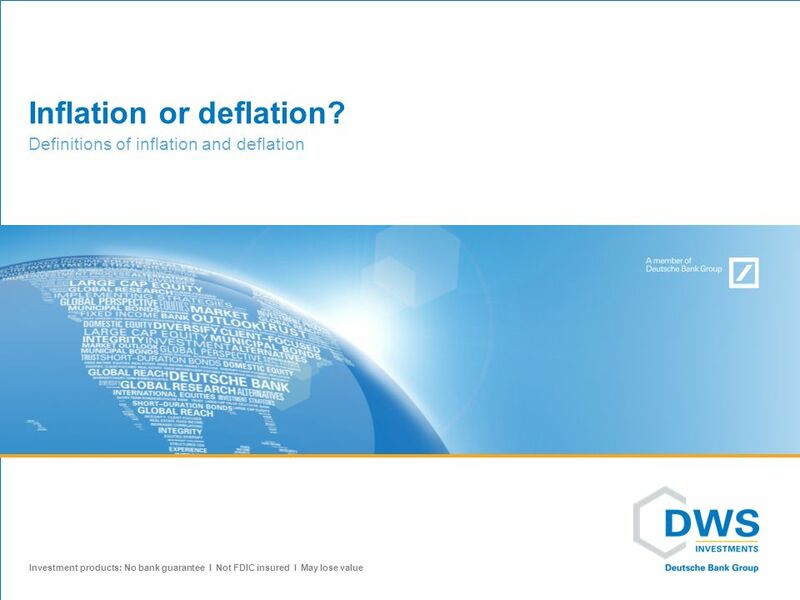 Definitions of inflation and deflation Inflation or deflation? Economic environment Recent occurrence Deflation – A decrease in the money supply often accompanied by a decrease in prices United States in the Great Depression Disinflation – Prices are still increasing, but at a slower rate than before United States in the 1990s Inflation – An increase in the money supply often accompanied by an increase in prices Most normal periods Stagflation – High inflation and high unemployment rate accompanied by stagnant economic growth United States in the 1970s Hyperinflation – Prices increase rapidly (out of control) as a currency loses its value Often ends in extreme political turmoil Germany post-World War I Zimbabwe in the 2000s Definitions: inflation or deflation? The sources, opinions and forecasts expressed are those of DWS, are as of 3/31/12 and any forward-looking statements may not actually come to pass. This information is subject to change at any time based on market and other conditions and should not be construed as investment advice. 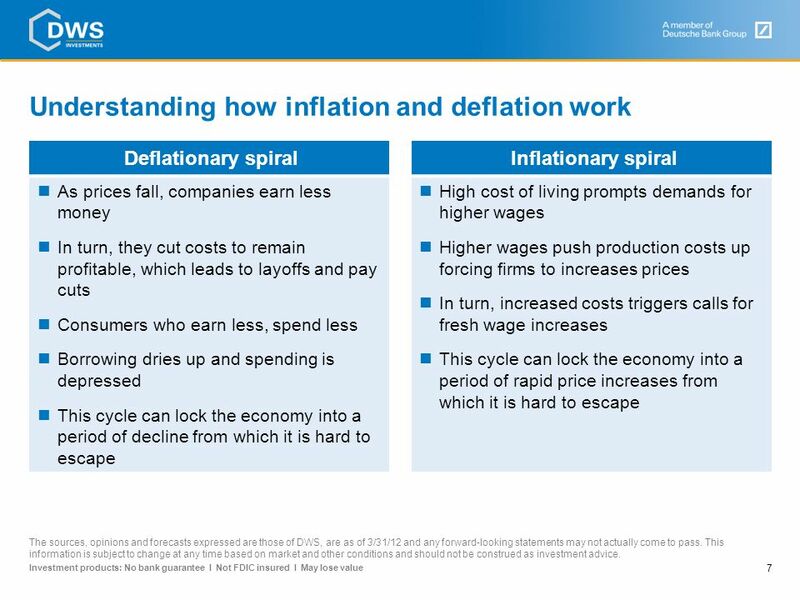 Deflationary spiral Inflationary spiral As prices fall, companies earn less money In turn, they cut costs to remain profitable, which leads to layoffs and pay cuts Consumers who earn less, spend less Borrowing dries up and spending is depressed This cycle can lock the economy into a period of decline from which it is hard to escape High cost of living prompts demands for higher wages Higher wages push production costs up forcing firms to increases prices In turn, increased costs triggers calls for fresh wage increases This cycle can lock the economy into a period of rapid price increases from which it is hard to escape Understanding how inflation and deflation work The sources, opinions and forecasts expressed are those of DWS, are as of 3/31/12 and any forward-looking statements may not actually come to pass. This information is subject to change at any time based on market and other conditions and should not be construed as investment advice. 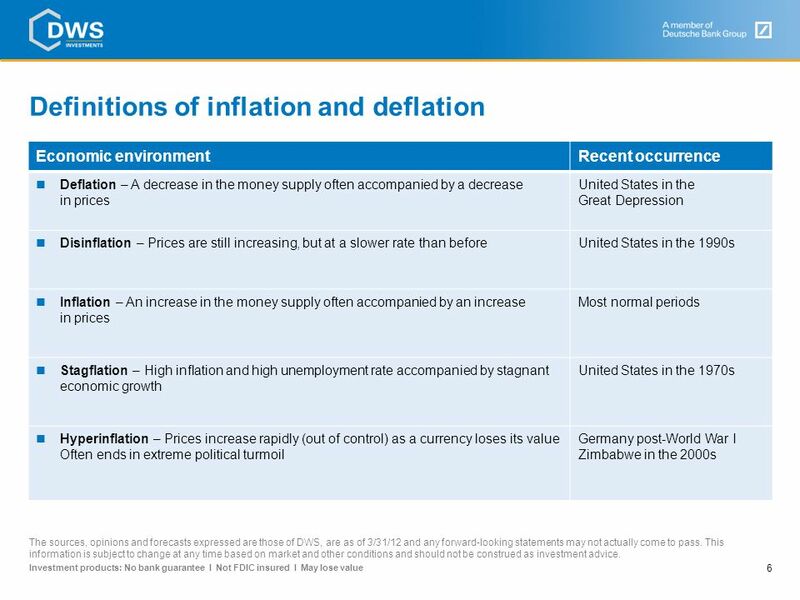 8 What signs of inflation or deflation are we seeing today? 1 2 What signs of inflation or deflation are we seeing today? 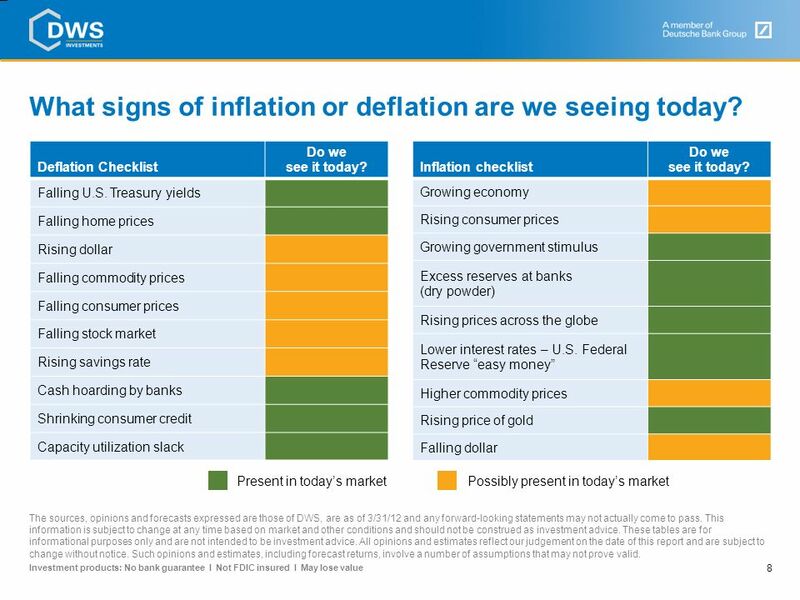 Deflation Checklist Do we see it today? Falling U.S. Treasury yields Falling home prices Rising dollar Falling commodity prices Falling consumer prices Falling stock market Rising savings rate Cash hoarding by banks Shrinking consumer credit Capacity utilization slack Inflation checklist Do we see it today? Growing economy Rising consumer prices Growing government stimulus Excess reserves at banks (dry powder) Rising prices across the globe Lower interest rates – U.S. Federal Reserve “easy money” Higher commodity prices Rising price of gold Falling dollar What signs of inflation or deflation are we seeing today? Possibly present in today’s market Present in today’s market The sources, opinions and forecasts expressed are those of DWS, are as of 3/31/12 and any forward-looking statements may not actually come to pass. This information is subject to change at any time based on market and other conditions and should not be construed as investment advice. These tables are for informational purposes only and are not intended to be investment advice. All opinions and estimates reflect our judgement on the date of this report and are subject to change without notice. Such opinions and estimates, including forecast returns, involve a number of assumptions that may not prove valid. Annual change in cpi (1913–2011) The CPI samples more than 80,000 items per month CPI category Weight Housing 42% Transportation 17% Food and beverage 15% Medical care 7% Recreation 6% Education and communication Apparel 4% Other goods and services 3% Average CPI 3.4% Consumer Price Index (CPI) basics One-year CPI (as of 3/31/12) 2.7% Source for chart: myinflationrate.com and U.S. Bureau of Labor Statistics as of 3/31/12. 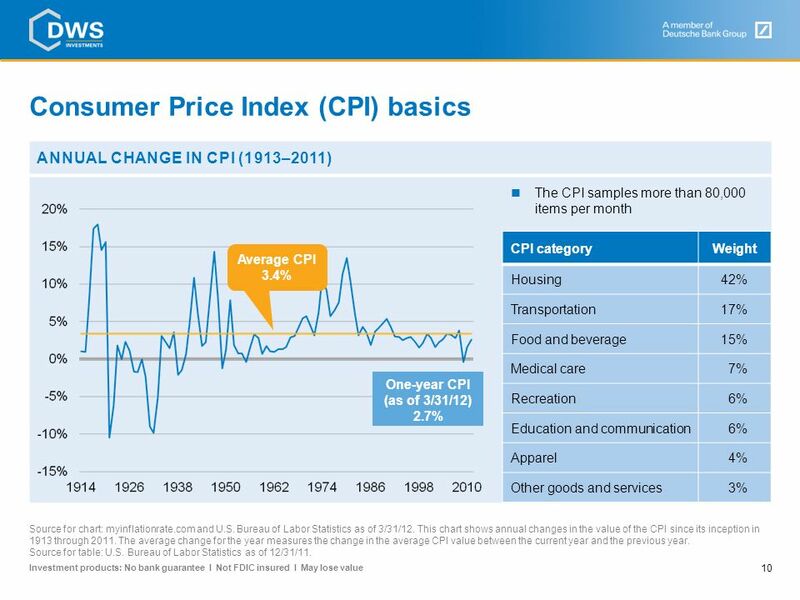 This chart shows annual changes in the value of the CPI since its inception in 1913 through The average change for the year measures the change in the average CPI value between the current year and the previous year. Source for table: U.S. Bureau of Labor Statistics as of 12/31/11. 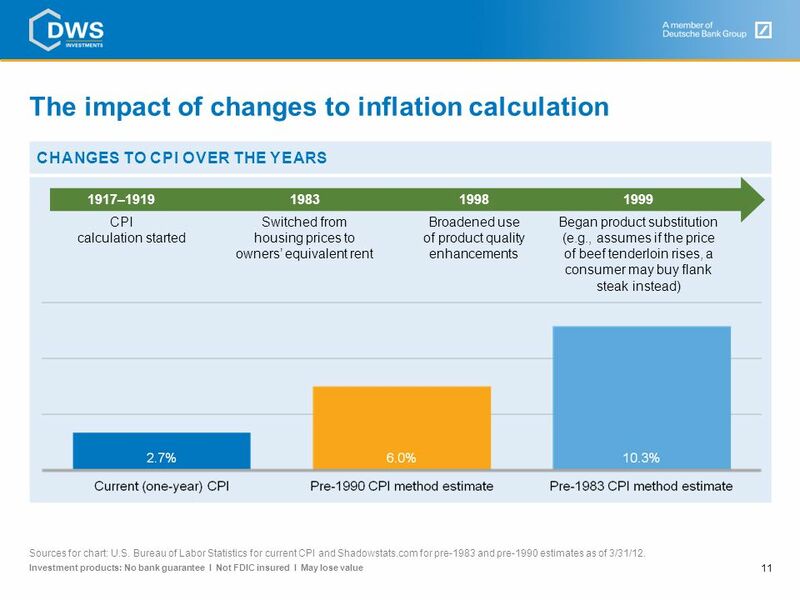 CHANGES TO CPI OVER THE YEARS 1917–1919 CPI calculation started 1983 Switched from housing prices to owners’ equivalent rent 1998 Broadened use of product quality enhancements 1999 Began product substitution (e.g., assumes if the price of beef tenderloin rises, a consumer may buy flank steak instead) The impact of changes to inflation calculation Sources for chart: U.S. Bureau of Labor Statistics for current CPI and Shadowstats.com for pre-1983 and pre-1990 estimates as of 3/31/12. 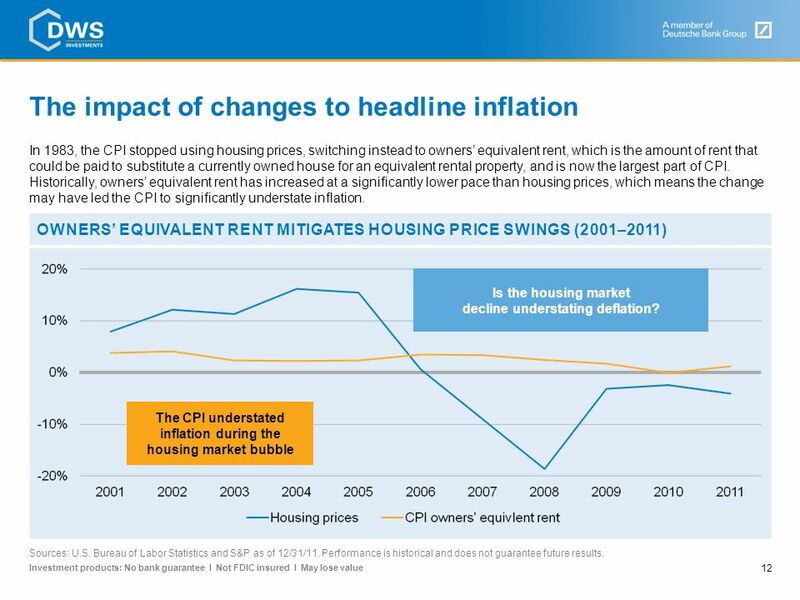 In 1983, the CPI stopped using housing prices, switching instead to owners’ equivalent rent, which is the amount of rent that could be paid to substitute a currently owned house for an equivalent rental property, and is now the largest part of CPI. Historically, owners’ equivalent rent has increased at a significantly lower pace than housing prices, which means the change may have led the CPI to significantly understate inflation. Owners’ equivalent rent mitigates housing price swings (2001–2011) Is the housing market decline understating deflation? The impact of changes to headline inflation The CPI understated inflation during the housing market bubble Sources: U.S. Bureau of Labor Statistics and S&P as of 12/31/11. Performance is historical and does not guarantee future results. How is price adjusted? TV A is no longer available and has been replaced by TV B. 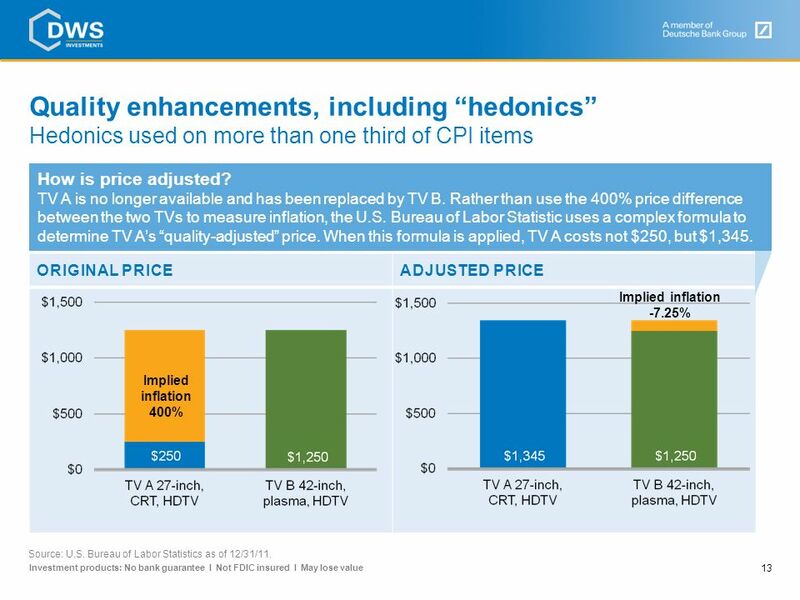 Rather than use the 400% price difference between the two TVs to measure inflation, the U.S. Bureau of Labor Statistic uses a complex formula to determine TV A’s “quality-adjusted” price. When this formula is applied, TV A costs not $250, but $1,345. Original price Adjusted price Implied inflation -7.25% Quality enhancements, including “hedonics” Implied inflation 400% Source: U.S. Bureau of Labor Statistics as of 12/31/11. 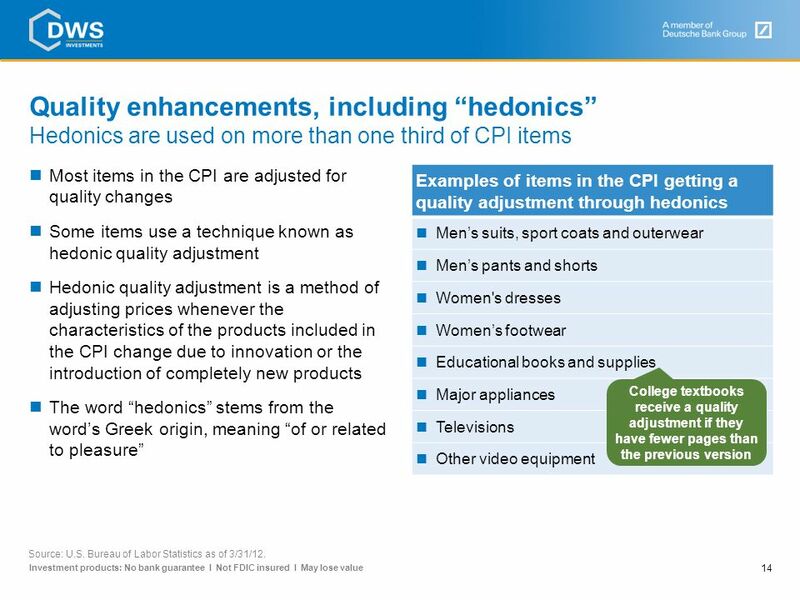 Most items in the CPI are adjusted for quality changes Some items use a technique known as hedonic quality adjustment Hedonic quality adjustment is a method of adjusting prices whenever the characteristics of the products included in the CPI change due to innovation or the introduction of completely new products The word “hedonics” stems from the word’s Greek origin, meaning “of or related to pleasure” Examples of items in the CPI getting a quality adjustment through hedonics Men’s suits, sport coats and outerwear Men’s pants and shorts Women's dresses Women’s footwear Educational books and supplies Major appliances Televisions Other video equipment Quality enhancements, including “hedonics” College textbooks receive a quality adjustment if they have fewer pages than the previous version Source: U.S. Bureau of Labor Statistics as of 3/31/12. 15 What’s going up and down in price? Needs (basic items) have seen the greatest price increases 10 largest 12-month item (category) increases Inflation Lamb and mutton (food) +39.28% Fuel oil (housing) +38.43% Gasoline (transportation) +34.28% Peanut butter (food) +33.96% Lamb and organ meats (food) +27.82% Bacon and related products (food) +26.23% Roasted coffee (food) +22.55% Uncooked other beef and veal (food) +21.18% Uncooked ground beef (food) +20.74% Video tape rental (recreation) +20.69% Needs! 7 food items 2 energy-related related items 1 recreation item Wants (luxury items) have seen the greatest price decreases 10 largest 12-month item (category) decreases Inflation Televisions (recreation) –29.97% Other video equipment (recreation) –22.61% PCs and equipment (education and comm.) –17.03% Utility (piped) gas service (housing) –15.17% Photographic equipment (recreation) –14.60% Software and accessories (education and comm.) –14.12% Video cassettes and discs (recreation) –11.99% Clock, lamps and decorate items (housing) –11.66% Dishes and flatware (housing) –11.41% Audio equipment (recreation) –10.16% Wants! 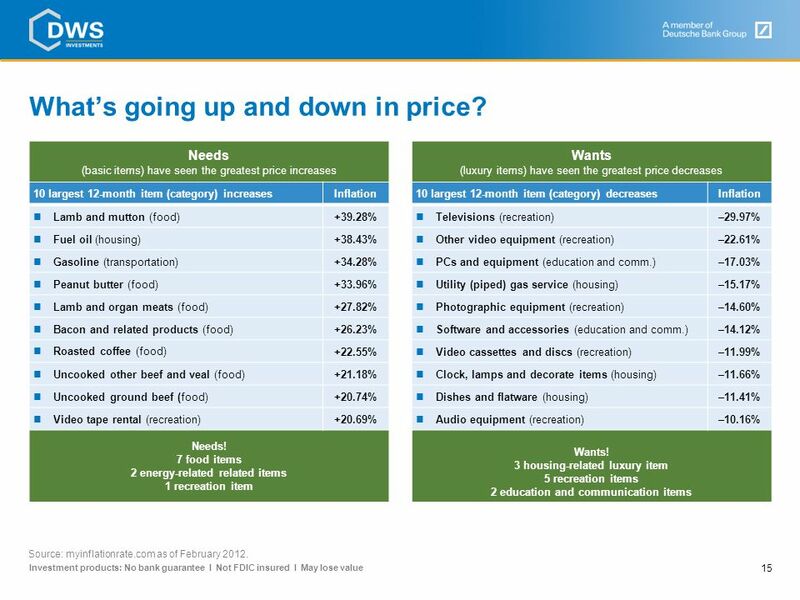 3 housing-related luxury item 5 recreation items 2 education and communication items What’s going up and down in price? Source: myinflationrate.com as of February 2012. Implications for retirement investing Inflation or deflation? 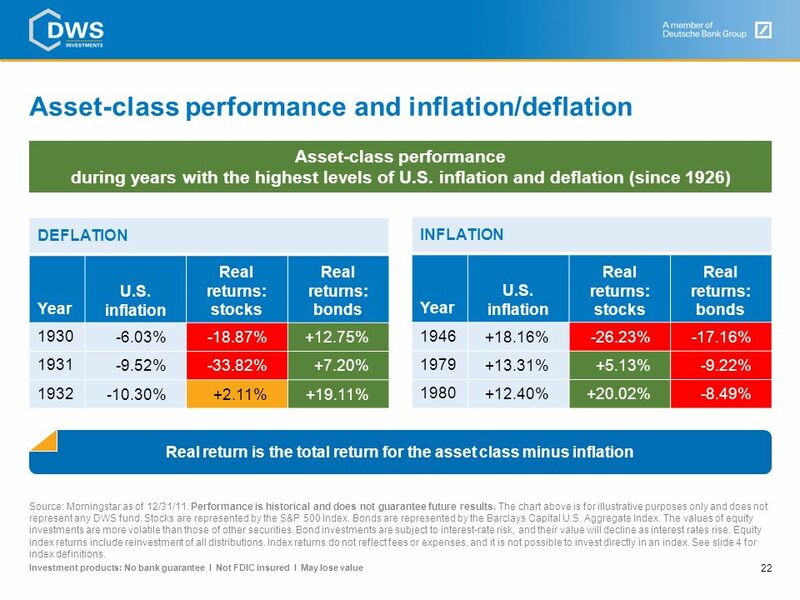 Asset-Class performance during years with the highest inflation (since 1921) Inflation averaged only 2.79% a year from 1921 through 2011, according to myinflationrate.com – but even that relatively low rate may decrease the returns of traditional investments. 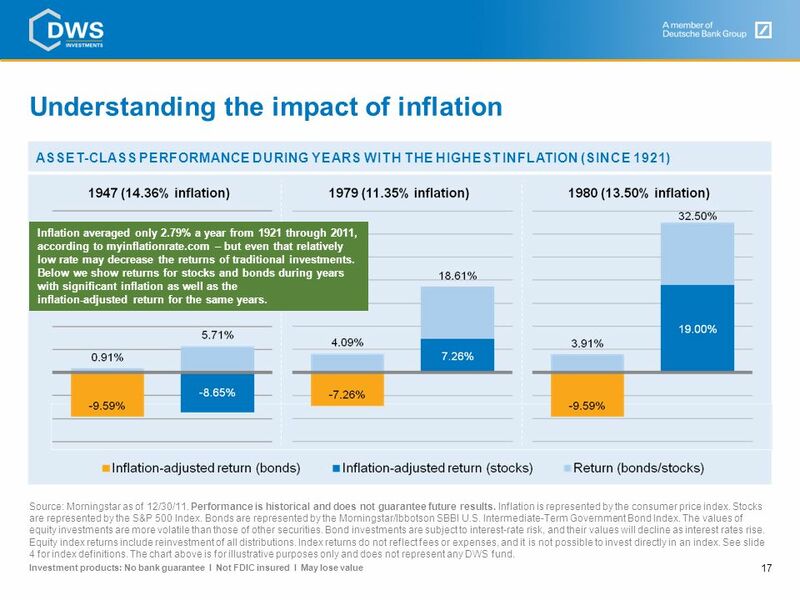 Below we show returns for stocks and bonds during years with significant inflation as well as the inflation-adjusted return for the same years. Understanding the impact of the phantom menace Source: Morningstar as of 12/30/11. Performance is historical and does not guarantee future results. Inflation is represented by the consumer price index. 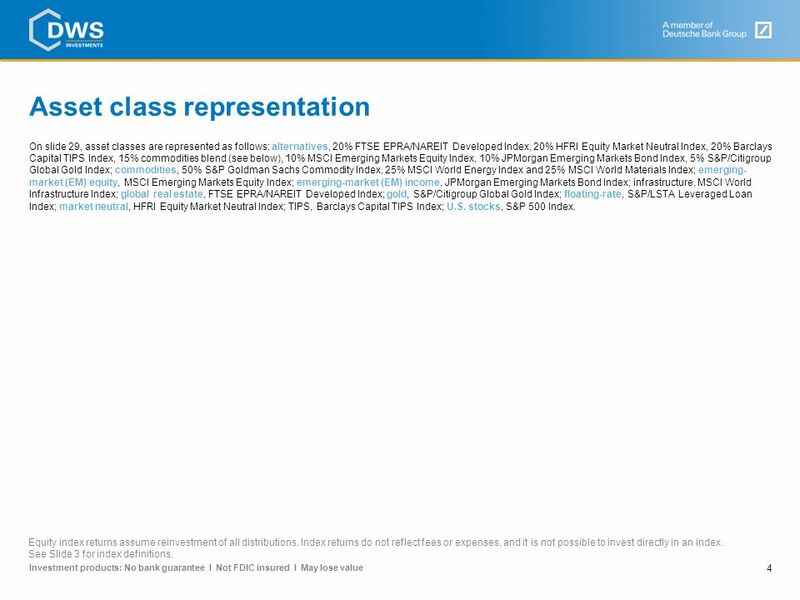 Stocks are represented by the S&P 500 Index. Bonds are represented by the Morningstar/Ibbotson SBBI U.S. Intermediate-Term Government Bond Index. The values of equity investments are more volatile than those of other securities. Bond investments are subject to interest-rate risk, and their values will decline as interest rates rise. Equity index returns include reinvestment of all distributions. Index returns do not reflect fees or expenses, and it is not possible to invest directly in an index. See slide 4 for index definitions. The chart above is for illustrative purposes only and does not represent any DWS fund. 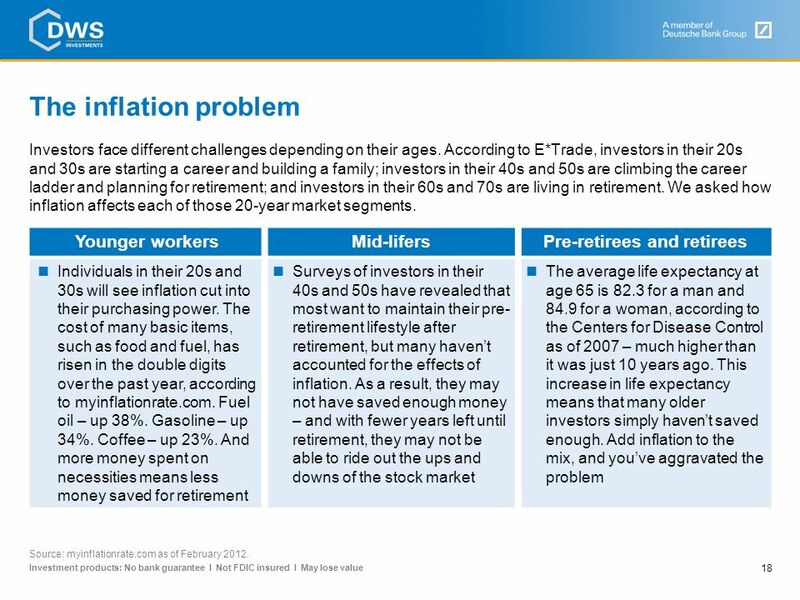 The inflation problem Investors face different challenges depending on their ages. According to E*Trade, investors in their 20s and 30s are starting a career and building a family; investors in their 40s and 50s are climbing the career ladder and planning for retirement; and investors in their 60s and 70s are living in retirement. We asked how inflation affects each of those 20-year market segments. Younger workers Mid-lifers Pre-retirees and retirees Individuals in their 20s and 30s will see inflation cut into their purchasing power. The cost of many basic items, such as food and fuel, has risen in the double digits over the past year, according to myinflationrate.com. Fuel oil – up 38%. Gasoline – up 34%. Coffee – up 23%. And more money spent on necessities means less money saved for retirement Surveys of investors in their 40s and 50s have revealed that most want to maintain their pre- retirement lifestyle after retirement, but many haven’t accounted for the effects of inflation. As a result, they may not have saved enough money – and with fewer years left until retirement, they may not be able to ride out the ups and downs of the stock market The average life expectancy at age 65 is 82.3 for a man and for a woman, according to the Centers for Disease Control as of 2007 – much higher than it was just 10 years ago. This increase in life expectancy means that many older investors simply haven’t saved enough. Add inflation to the mix, and you’ve aggravated the problem The inflation problem Source: myinflationrate.com as of February 2012. 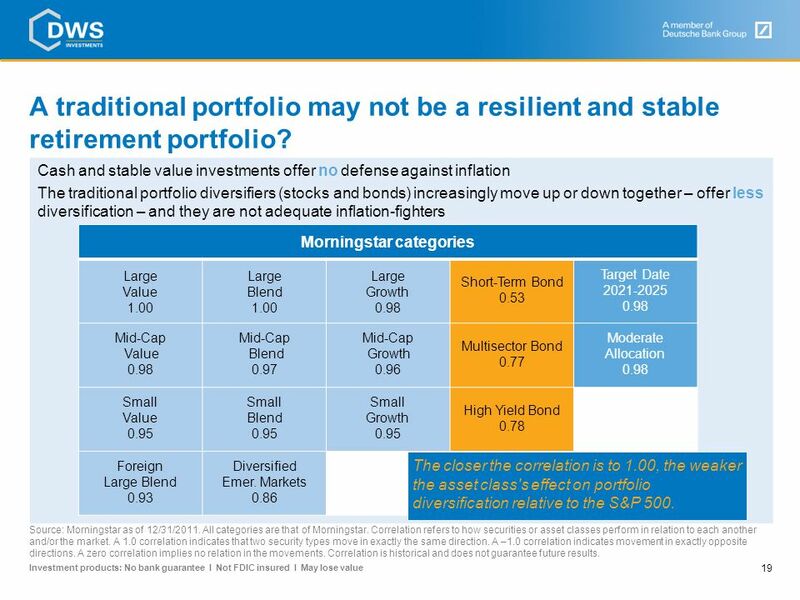 A traditional portfolio may not be a resilient and stable retirement portfolio? Cash and stable value investments offer no defense against inflation The traditional portfolio diversifiers (stocks and bonds) increasingly move up or down together – offer less diversification – and they are not adequate inflation-fighters Morningstar categories Large Value 1.00 Blend Growth 0.98 Short-Term Bond 0.53 Target Date Mid-Cap 0.97 0.96 Multisector Bond 0.77 Moderate Allocation Small 0.95 Small Blend Small Growth High Yield Bond 0.78 Foreign Large Blend 0.93 Diversified Emer. Markets 0.86 We’ve seen why inflation is a problem for participants – but why is it a special problem for retirement plans? Because the investment options your plan offers right now may not be the right ones to fight inflation. As we’ve discussed, cash and stable value investment offer no defense against inflation. But the traditional portfolio diversifiers like stocks and bonds increasingly move up or down together. They offer less diversification than they used to, and in general, they are not adequate inflation-fighters. Stocks and bonds moving up or down together means they are increasingly correlated. The closer they are to 1.00, the more correlated they are, and the more difficult it is to achieve true diversification in a retirement portfolio. The closer the correlation is to 1.00, the weaker the asset class's effect on portfolio diversification relative to the S&P 500. Source: Morningstar as of 12/31/2011. All categories are that of Morningstar. Correlation refers to how securities or asset classes perform in relation to each another and/or the market. A 1.0 correlation indicates that two security types move in exactly the same direction. A –1.0 correlation indicates movement in exactly opposite directions. A zero correlation implies no relation in the movements. Correlation is historical and does not guarantee future results. during years with the highest levels of U.S. inflation and deflation (since 1926) DEFLATION Year U.S. inflation Real returns: stocks Real returns: bonds 1930 -6.03% -18.87% +12.75% 1931 -9.52% -33.82% +7.20% 1932 -10.30% +2.11% +19.11% INFLATION Year U.S. inflation Real returns: stocks Real returns: bonds 1946 +18.16% -26.23% -17.16% 1979 +13.31% +5.13% -9.22% 1980 +12.40% +20.02% -8.49% Asset class performance and inflation/deflation Real return is the total return for the asset class minus inflation Source: Morningstar as of 12/31/11. Performance is historical and does not guarantee future results. The chart above is for illustrative purposes only and does not represent any DWS fund. Stocks are represented by the S&P 500 Index. 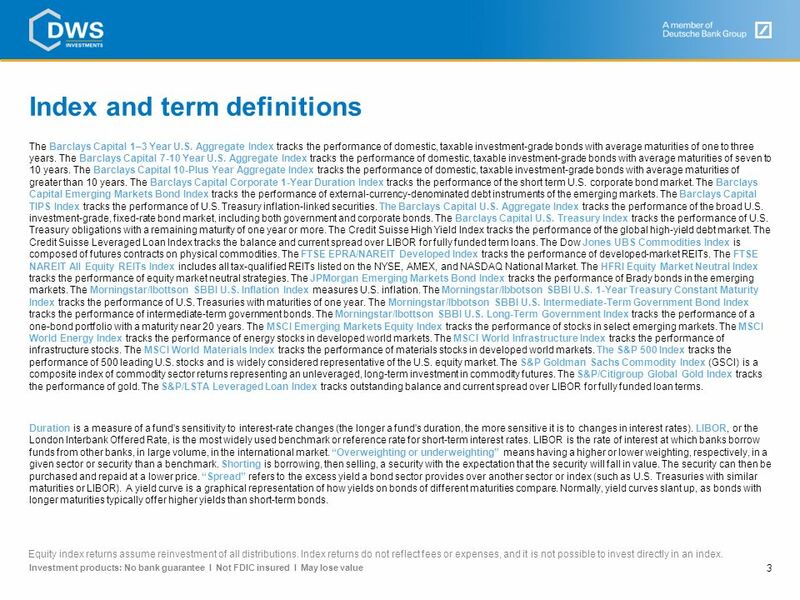 Bonds are represented by the Barclays Capital U.S. Aggregate Index. The values of equity investments are more volatile than those of other securities. Bond investments are subject to interest-rate risk, and their value will decline as interest rates rise. Equity index returns include reinvestment of all distributions. Index returns do not reflect fees or expenses, and it is not possible to invest directly in an index. See slide 4 for index definitions. 23 What has the potential to work during inflation/deflation? U.S. stocks International stocks Treasury, agency and high-grade corporate bonds High-yield bonds and floating-rate loans bonds Hard assets and commodities Alternatives Cash Deflation Inflation Often works Sometimes works Rarely works Summary of what potentially works Deflation: Cash, U.S. Treasuries, agency mortgages, high-grade corporate bonds and some alternatives (such as market neutral) may work Inflation: International stocks and bonds (as the dollar declines), high-yield bonds and floating-rate loans, hard assets and alternative asset classes may work This slide reflects our opinions about what may potentially work during inflation/deflation The values of equity investments are more volatile than those of other securities. Fixed-income investments are subject to interest-rate risk, and their value will decline as interest rates rise. Commodities are long-term investments and should be considered part of a diversified portfolio; market-price movements, regulatory changes, economic changes and adverse political or financial factors could have a significant impact on performance. Alternative investments can be less liquid and more volatile than traditional investments, and often lack longer-term track records. The sources, opinions and forecasts expressed are those of DWS, are as of 3/31/12 and any forward-looking statements may not actually come to pass. This information is subject to change at any time based on market and other conditions and should not be construed as investment advice. This table is for informational purposes only and is not intended to be investment advice. All opinions and estimates reflect our judgement on the date of this report and are subject to change without notice. Such opinions and estimates, including forecast returns, involve a number of assumptions that may not prove valid. 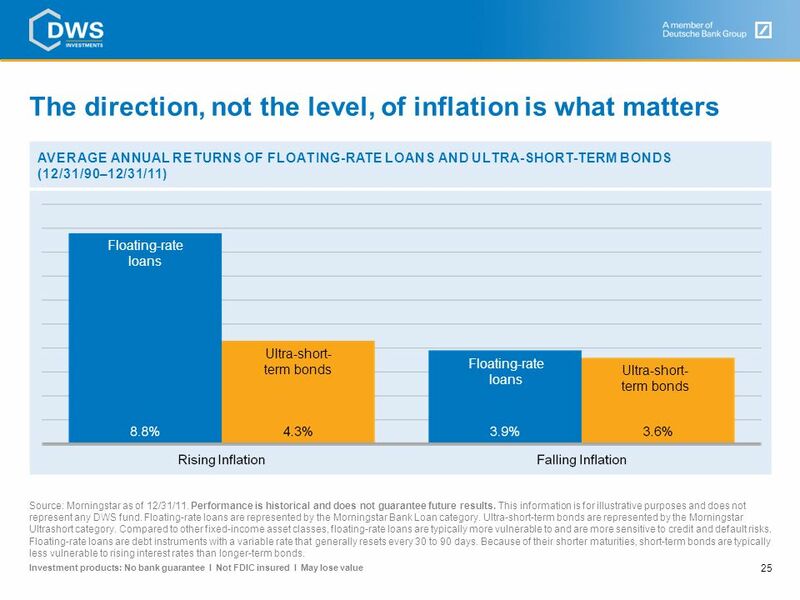 average annual returnS OF floating-rate loans AND ULTRA-SHORT-TERM BONDS (12/31/90–12/31/11) Floating-rate loans Ultra-short-term bonds Floating-rate loans The direction, not the level, of inflation is what matters Ultra-short-term bonds Source: Morningstar as of 12/31/11. Performance is historical and does not guarantee future results. This information is for illustrative purposes and does not represent any DWS fund. Floating-rate loans are represented by the Morningstar Bank Loan category. 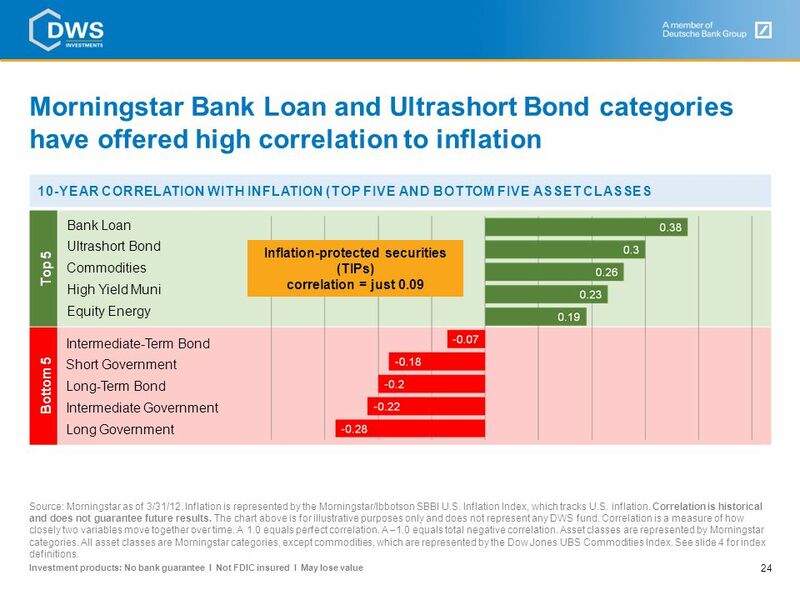 Ultra-short-term bonds are represented by the Morningstar Ultrashort category. Compared to other fixed-income asset classes, floating-rate loans are typically more vulnerable to and are more sensitive to credit and default risks. Floating-rate loans are debt instruments with a variable rate that generally resets every 30 to 90 days. Because of their shorter maturities, short-term bonds are typically less vulnerable to rising interest rates than longer-term bonds. POTENTIAL BENEFITS OF MINIMIZING DURATION EXPOSURE DURING RISING-RATE ENVIRONMENTS (2/1/60–9/30/81) During the last secular rising-rate environment, an investment with low duration exposure outperformed bonds with longer duration exposure in 88% of rolling five-year periods, according to Morningstar as of 3/31/12. 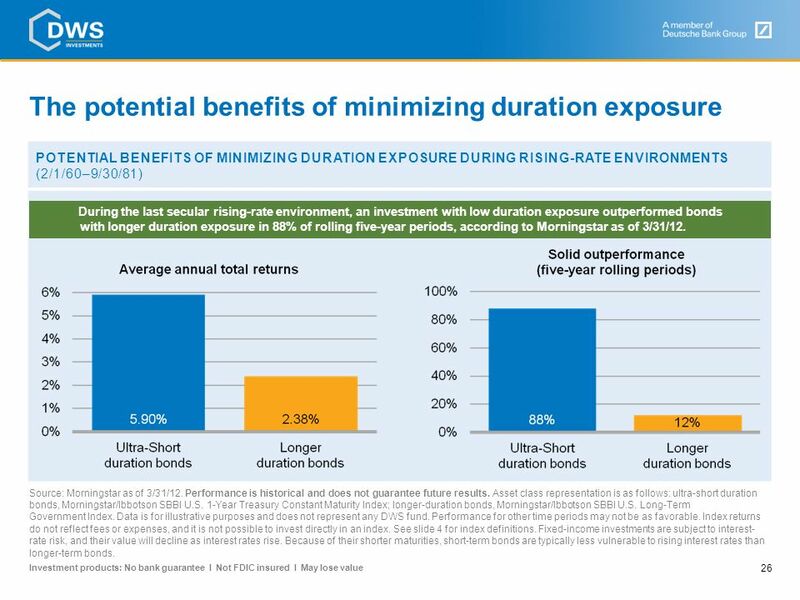 The potential benefits of minimizing duration exposure Source: Morningstar as of 3/31/12. Performance is historical and does not guarantee future results. Asset class representation is as follows: ultra-short duration bonds, Morningstar/Ibbotson SBBI U.S. 1-Year Treasury Constant Maturity Index; longer-duration bonds, Morningstar/Ibbotson SBBI U.S. Long-Term Government Index. Data is for illustrative purposes and does not represent any DWS fund. Performance for other time periods may not be as favorable. Index returns do not reflect fees or expenses, and it is not possible to invest directly in an index. See slide 4 for index definitions. Fixed-income investments are subject to interest-rate risk, and their value will decline as interest rates rise. Because of their shorter maturities, short-term bonds are typically less vulnerable to rising interest rates than longer-term bonds. TOTAL RETURN OF ASSET CLASSES (10/8/10–2/8/11, THE LAST INTEREST-RATE SPIKE) From 10/8/10 to 2/8/11, the 10-year U.S. Treasury yield increased by 134 basis points, from 2.38% to 3.72%. 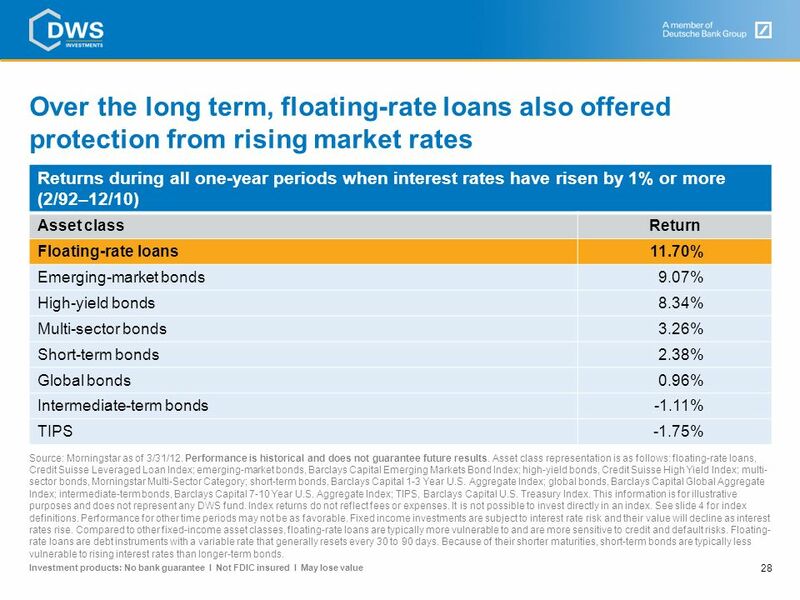 During this period, floating-rate loans were the best-performing fixed-income asset class, outperforming intermediate-term bonds by 10.82%. 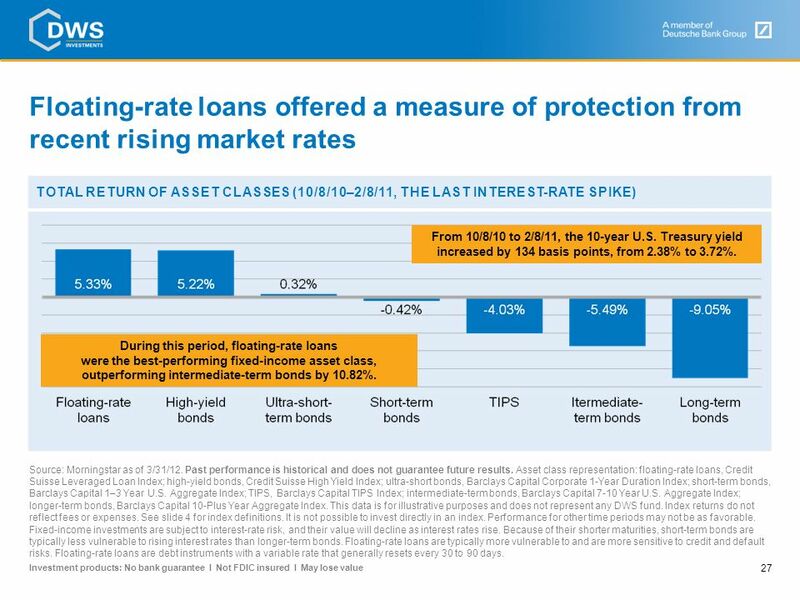 Floating-rate loans offered a measure of protection from recent rising market rates Source: Morningstar as of 3/31/12. Past performance is historical and does not guarantee future results. 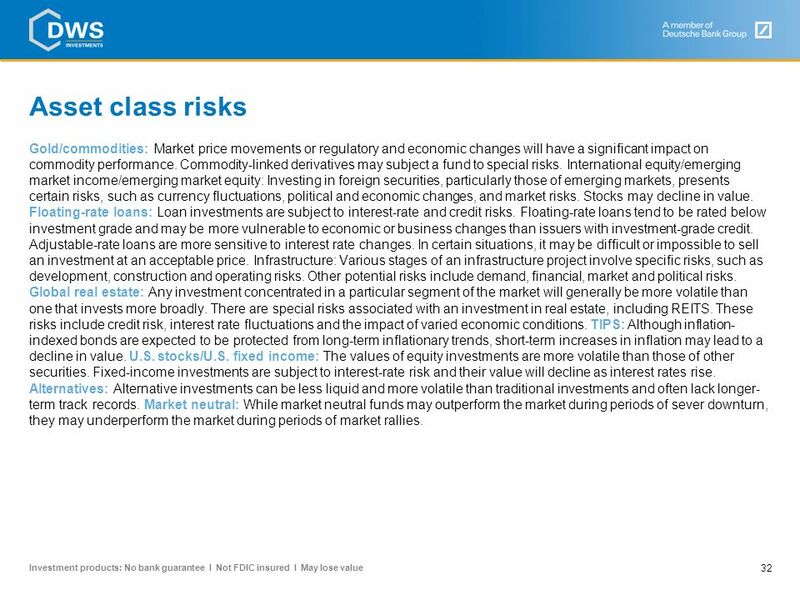 Asset class representation: floating-rate loans, Credit Suisse Leveraged Loan Index; high-yield bonds, Credit Suisse High Yield Index; ultra-short bonds, Barclays Capital Corporate 1-Year Duration Index; short-term bonds, Barclays Capital 1–3 Year U.S. 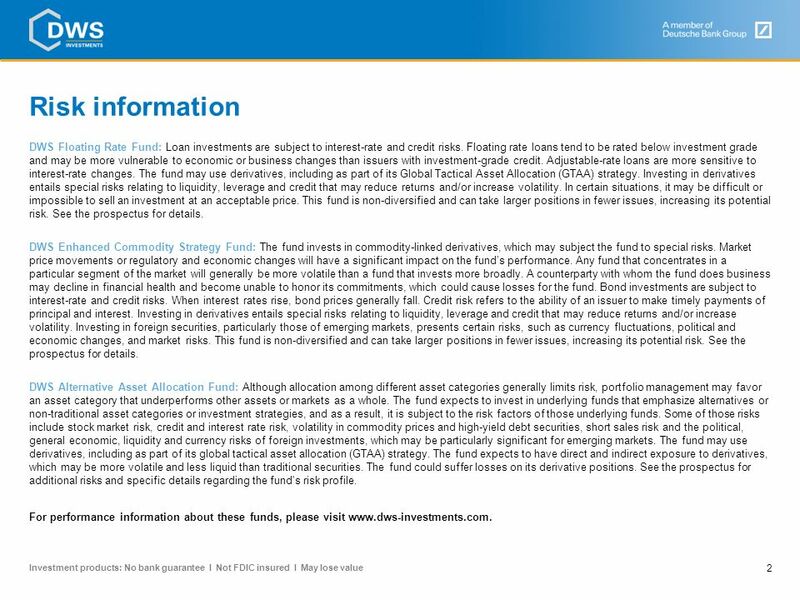 Aggregate Index; TIPS, Barclays Capital TIPS Index; intermediate-term bonds, Barclays Capital 7-10 Year U.S. Aggregate Index; longer-term bonds, Barclays Capital 10-Plus Year Aggregate Index. This data is for illustrative purposes and does not represent any DWS fund. Index returns do not reflect fees or expenses. See slide 4 for index definitions. It is not possible to invest directly in an index. Performance for other time periods may not be as favorable. Fixed-income investments are subject to interest-rate risk, and their value will decline as interest rates rise. Because of their shorter maturities, short-term bonds are typically less vulnerable to rising interest rates than longer-term bonds. Floating-rate loans are typically more vulnerable to and are more sensitive to credit and default risks. Floating-rate loans are debt instruments with a variable rate that generally resets every 30 to 90 days. Commodities have performed well when inflation has risen (average annual total return, 12/31/76 – 12/31/11) Average inflation is represented by the average US Consumer Price Index (CPI) inflation growth rate from 12/31/76 through 12/31/11, which was 4.4%. Inflation was considered rising when it was higher than it was one year prior. 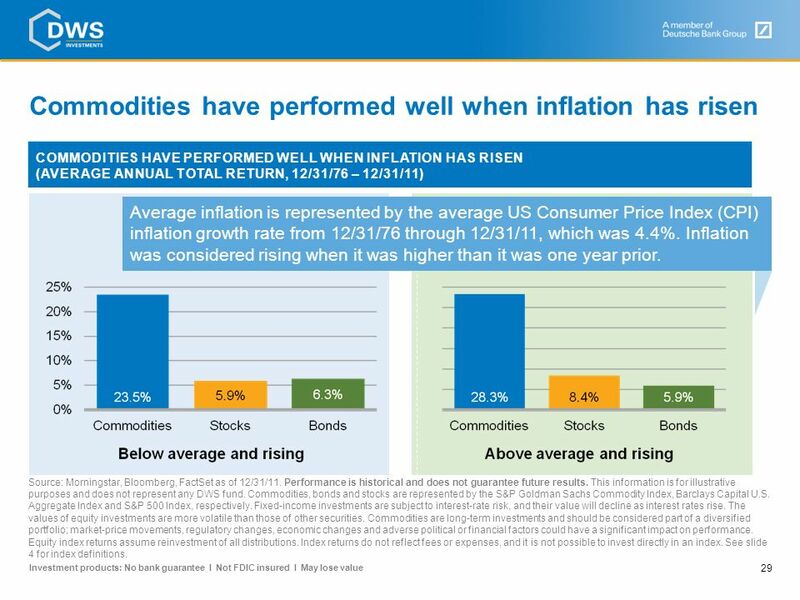 Commodities have performed well when inflation has risen Source: Morningstar, Bloomberg, FactSet as of 12/31/11. Performance is historical and does not guarantee future results. This information is for illustrative purposes and does not represent any DWS fund. Commodities, bonds and stocks are represented by the S&P Goldman Sachs Commodity Index, Barclays Capital U.S. Aggregate Index and S&P 500 Index, respectively. Fixed-income investments are subject to interest-rate risk, and their value will decline as interest rates rise. The values of equity investments are more volatile than those of other securities. Commodities are long-term investments and should be considered part of a diversified portfolio; market-price movements, regulatory changes, economic changes and adverse political or financial factors could have a significant impact on performance. Equity index returns assume reinvestment of all distributions. Index returns do not reflect fees or expenses, and it is not possible to invest directly in an index. See slide 4 for index definitions. 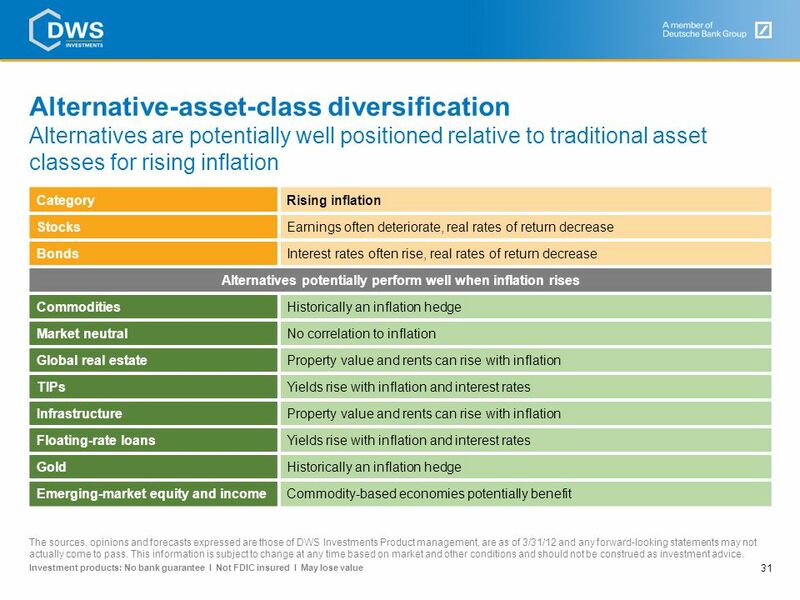 Alternative-asset-class diversification Alternatives are potentially well positioned relative to traditional asset classes for rising inflation Category Rising inflation Stocks Earnings often deteriorate, real rates of return decrease Bonds Interest rates often rise, real rates of return decrease Alternatives potentially perform well when inflation rises Commodities Historically an inflation hedge Market neutral No correlation to inflation Global real estate Property value and rents can rise with inflation TIPs Yields rise with inflation and interest rates Infrastructure Floating-rate loans Gold Emerging-market equity and income Commodity-based economies potentially benefit Alternative-asset-class diversification The sources, opinions and forecasts expressed are those of DWS Investments Product management, are as of 3/31/12 and any forward-looking statements may not actually come to pass. This information is subject to change at any time based on market and other conditions and should not be construed as investment advice. 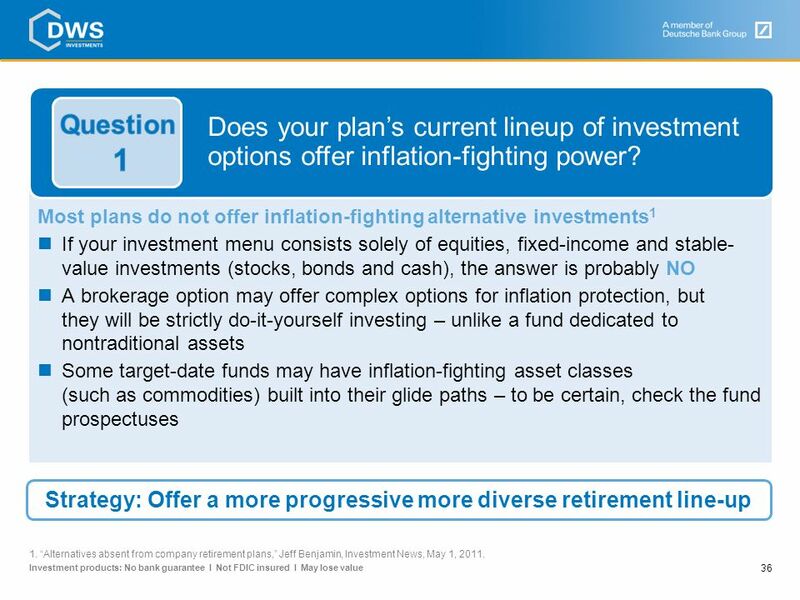 Does your plan’s current lineup of investment options offer inflation-fighting power? 1 At what ages will participants benefit most from inflation-aware investing? 2 What kind of options should you consider adding in your lineup? 3 What can we do with these ideas as far as our retirement plans are concerned? 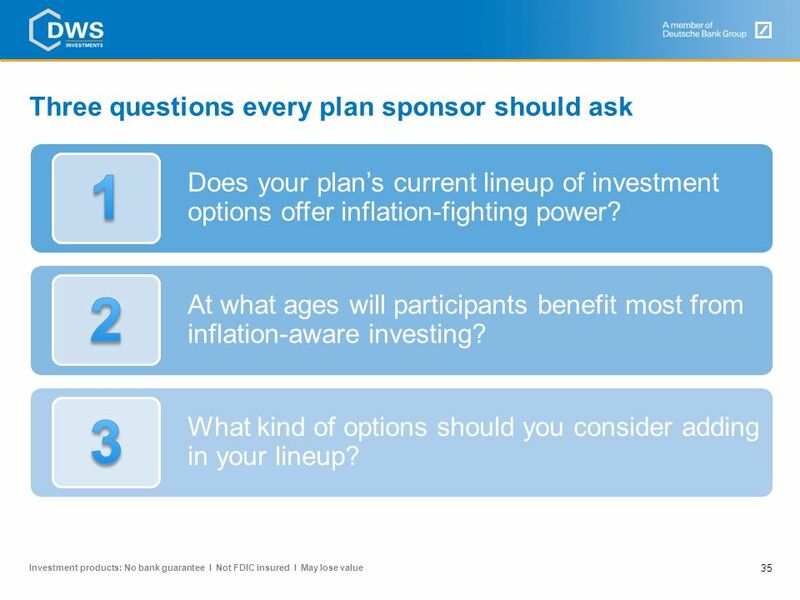 Here are three questions that every plan sponsor should ask himself or herself: Does your plan’s current lineup of investment options offer inflation-fighting power? At what ages will participants benefit most from inflation-aware investing? What kind of options should you consider adding in your lineup? Let’s answer them one by one. 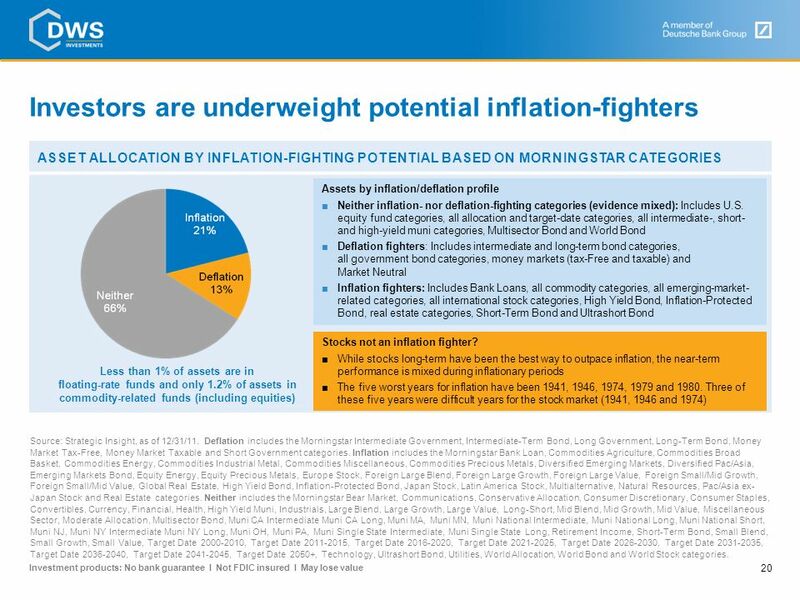 Does your plan’s current lineup of investment options offer inflation-fighting power? Question 1 Most plans do not offer inflation-fighting alternative investments1 If your investment menu consists solely of equities, fixed-income and stable- value investments (stocks, bonds and cash), the answer is probably NO A brokerage option may offer complex options for inflation protection, but they will be strictly do-it-yourself investing – unlike a fund dedicated to nontraditional assets Some target-date funds may have inflation-fighting asset classes (such as commodities) built into their glide paths – to be certain, check the fund prospectuses Question 1 is: Does your current plan lineup offer inflation-fighting investments? Nationwide, most plans do not offer inflation-fighting alternative investments. If your investment menu is like nearly every other investment menu out there, then it consists almost exclusively of equities, fixed-income and stable-value investments (stocks, bonds and cash) in various combinations. So the answer is probably no. Although there are unexpected exceptions. A brokerage option may offer complex options for inflation protection, but they will be strictly do-it-yourself investing – unlike a fund dedicated to nontraditional assets Here’s another example. Some target-date funds may have inflation-fighting asset classes (such as commodities) built into their glide paths. There’s no way to know for sure just by looking at the fund name. 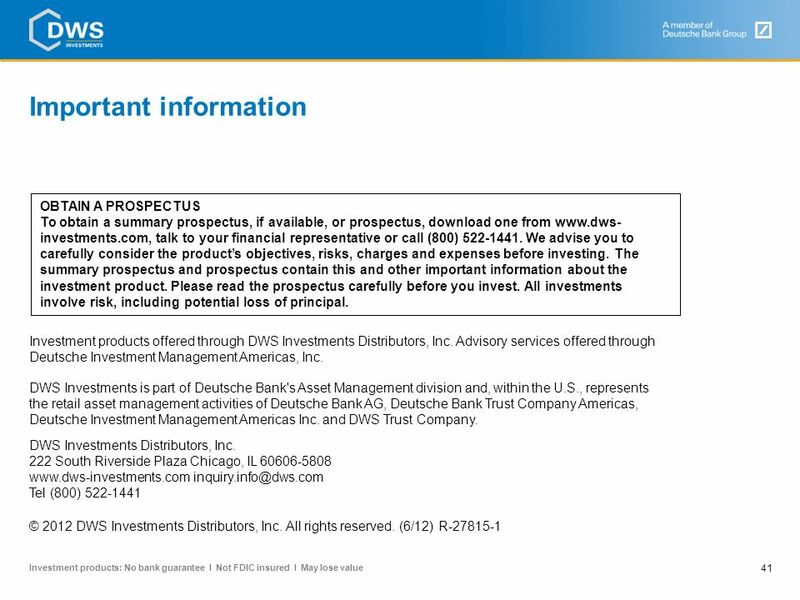 To be certain, you need to check the fund prospectuses. Source: Strategy: Offer a more progressive more diverse retirement line-up 1. “Alternatives absent from company retirement plans,” Jeff Benjamin, Investment News, May 1, 2011. At what ages will participants benefit most from inflation-aware investing? 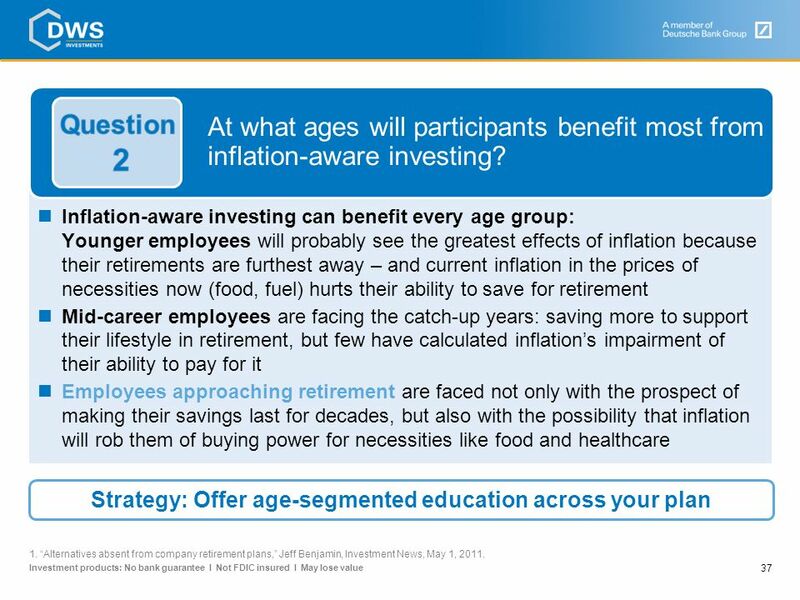 Question 2 Inflation-aware investing can benefit every age group: Younger employees will probably see the greatest effects of inflation because their retirements are furthest away – and current inflation in the prices of necessities now (food, fuel) hurts their ability to save for retirement Mid-career employees are facing the catch-up years: saving more to support their lifestyle in retirement, but few have calculated inflation’s impairment of their ability to pay for it Employees approaching retirement are faced not only with the prospect of making their savings last for decades, but also with the possibility that inflation will rob them of buying power for necessities like food and healthcare Next question: At what ages will participants benefit most from inflation-aware investing? As we saw with our own results in the DWS retirement plan we discussed a minute ago, it’s apparent that inflation-aware investing can benefit every age group: Younger employees will probably see the greatest effects of inflation because their retirements are furthest away – and current inflation in the prices of necessities now (such as food and fuel) hurts their ability to save for retirement. So whatever level of savings they do manage to put away will benefit in the distant future from inflation-aware investing today. Mid-career employees are facing the catch-up years: saving more to support their lifestyle in retirement, but few have calculated inflation’s impairment of their ability to pay for it. The simple solution is to recalculate your savings rate today based on your future financial needs – but to do so by factoring in the potential for an average inflation rate of, say, 4% annually. People approaching retirement are faced not only with the prospect of making their savings last for decades, but also with the possibility that inflation will rob them of buying power for necessities like food and healthcare. We believe that investing for inflation will not only affect your working years, but also your retirement years. Because many of us are facing the possibility of a 20- or 30-year retirement, thanks to longer life spans, we will continue to need to think investing for the long term well into retirement. Strategy: Offer age-segmented education across your plan 1. “Alternatives absent from company retirement plans,” Jeff Benjamin, Investment News, May 1, 2011. 38 What kind of investment options should you consider adding in your lineup? 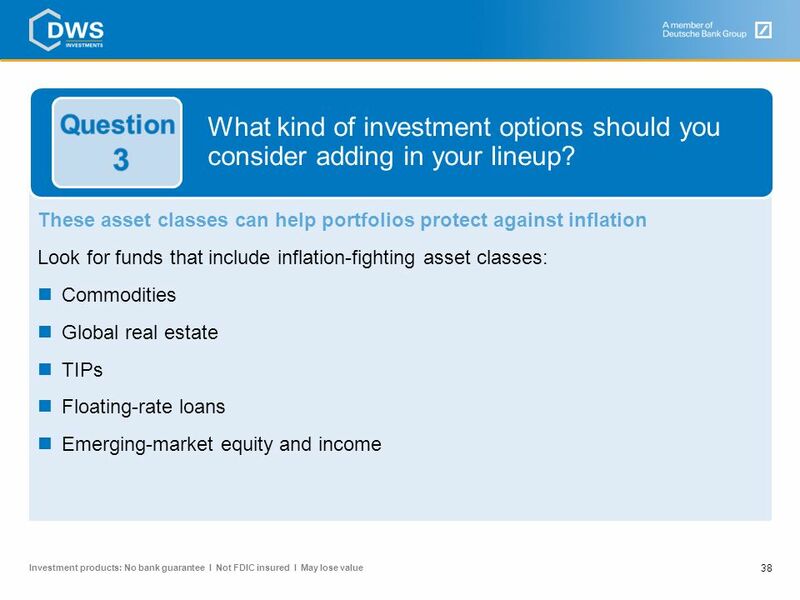 Question 3 These asset classes can help portfolios protect against inflation Look for funds that include inflation-fighting asset classes: Commodities Global real estate TIPs Floating-rate loans Emerging-market equity and income Last question: What kinds of investment options should you consider adding to your lineup? 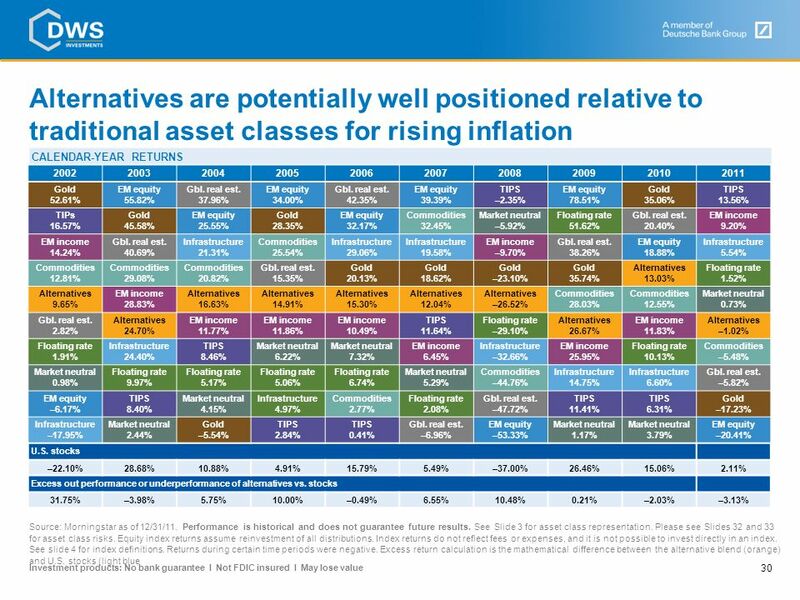 As we saw earlier, these are the best asset classes to help portfolios protect against inflation. Look for funds that include some or all of the inflation-fighting asset classes: Commodities Global real estate TIPs Floating-rate loans Emerging-market equity and income We’ve seen that stocks and bonds and cash won’t be of much help to our plan participants when it comes to offsetting the bad effects of inflation on their buying power. As plan sponsors, what can we do now to help them prepare for this serious potential threat? 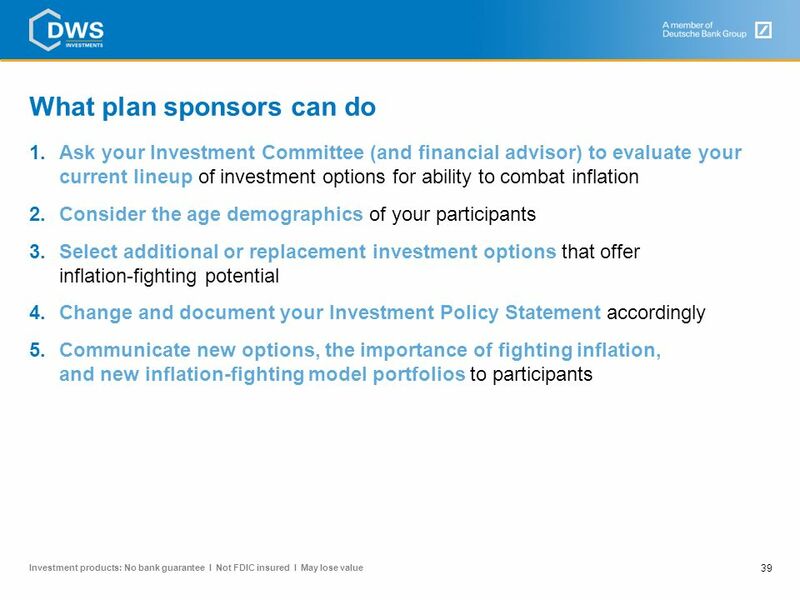 Ask your Investment Committee (and financial advisor) to evaluate your current lineup of investment options for ability to combat inflation Consider the age demographics of your participants Select additional or replacement investment options that offer inflation-fighting potential Change and document your Investment Policy Statement accordingly Communicate new options, the importance of fighting inflation, and new inflation-fighting model portfolios to participants Here are five simple steps you can take right away. First, ask your Investment Committee — and, if you work with one, your plan’s financial advisor — to evaluate your current lineup of investment options for their ability to combat inflation. Then, consider the age demographics of your participants. If the average age of your workforce is especially old or young, it may affect the kinds of inflation-fighting asset classes you may want to add. 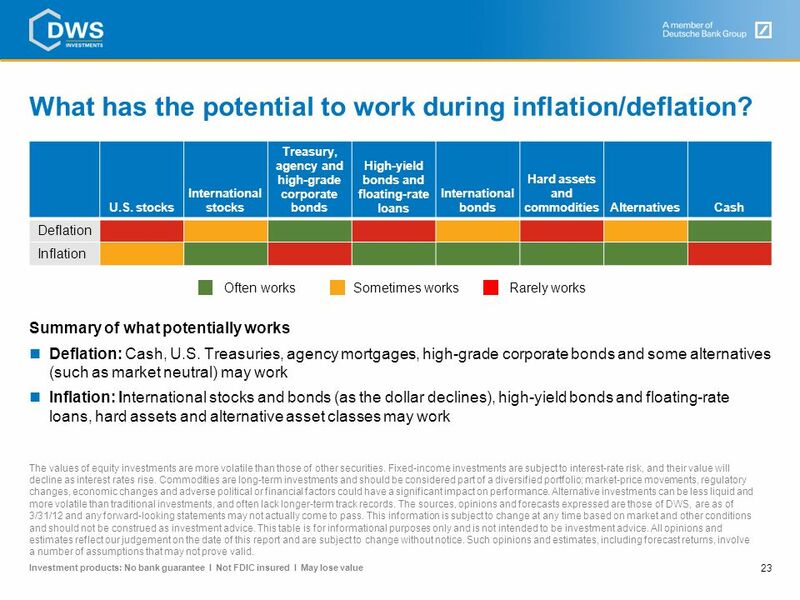 Although they are all historically better at fighting inflation that traditional investments, each of those classes has its own risk and reward characteristics that may play a role in your decision. Next, select additional or replacement investment options that offer inflation-fighting potential. You can simply add to your current lineup, or replace funds you may have been considering terminating anyway. Fourth, and very important: Don’t forget to change and document your Investment Policy Statement accordingly. 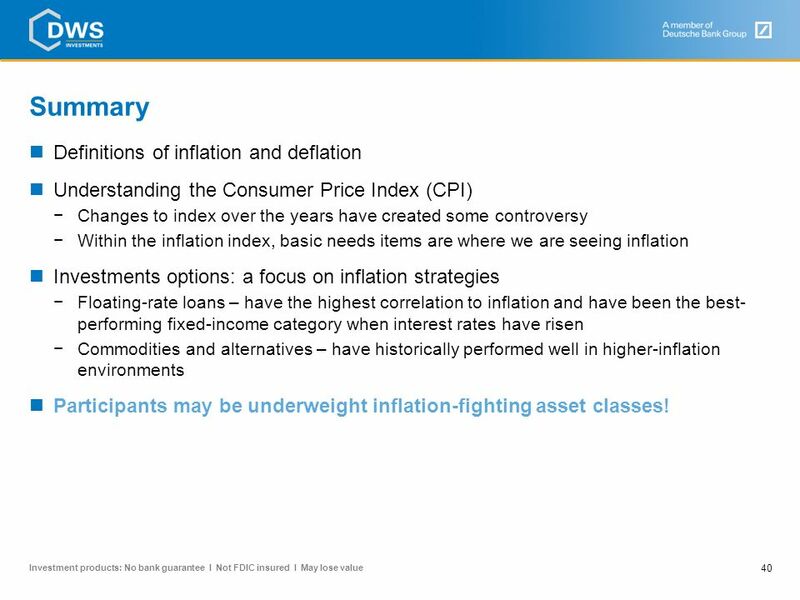 Finally, communicate your new options, demonstrate the importance of fighting inflation, and show these new inflation-fighting model portfolios to participants. 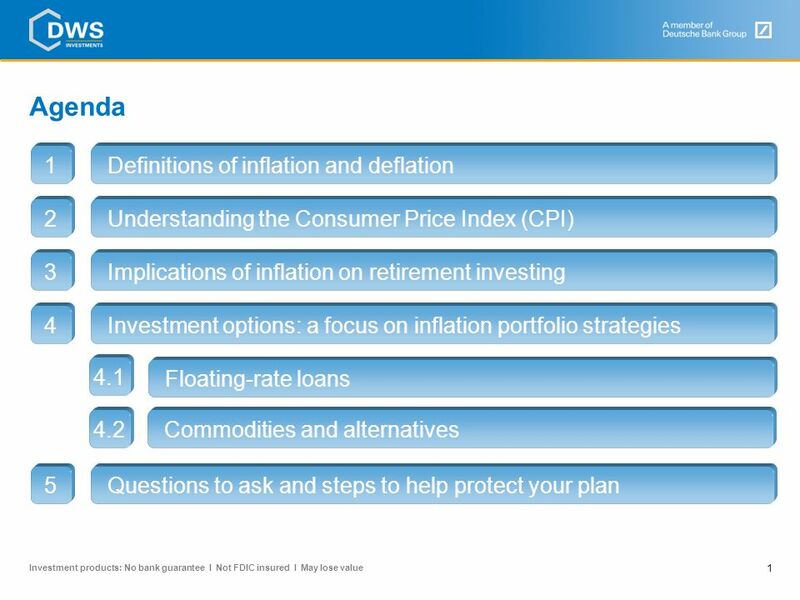 Download ppt "Agenda 1 Definitions of inflation and deflation 2"
Time to Invest in Short-Term Bonds? First Quarter 2010.